Today was a national holiday, so I got to teach a morning shift for a change. It was nice to be done and still have the rest of the day ahead of me. The trainees still don’t own watches. Having the evening free allowed me to take advantage of a unique opportunity. One of the two Japanese people living in Hello House, let’s call her Kyoko, worked in the fashion industry. Thanks to her connections, she was able to get a bunch of discount tickets to Velfarre’s 10th anniversary celebration. 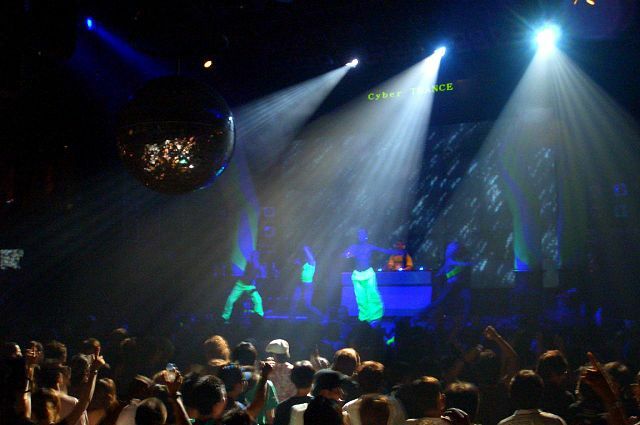 Velfarre is Tokyo’s biggest dance club located in Roppongi. I am not usually a big fan of dance music, but part of the reason why I moved to Japan was to get new life experiences. It’s not every day that I get invited to this kind of event, so I grabbed a quick afternoon nap and got dressed up for a night out. The Hello House group met up and we all headed out to Roppongi. Our discount tickets cost 4000 yen, which I thought was pretty expensive for a night club. When we arrived I found out that the full price tickets were a whopping 7000 yen. Yikes! The disco spirit is alive and well at Velfarre. The entrance leads to a huge “chill out” area, but the dance floor is 3 stories underground. To get there we all entered an elevator that featured flashing disco lights and loud techno music. The elevator music only seemed loud until we arrived at the lower level and the doors opened, exposing us to the full power of Velfarre’s sound system. There were 3 DJs featured during the evening, entertaining people on a MASSIVE dance floor that was completely packed. It was like being on the floor at a large arena concert. At the front was a large stage with the DJ and several large, half naked black men dancing while covered in glitter and angel wings. Off the dance floor there were several bars featuring very expensive drinks. I decided to skip the bar line and walked over to a nearby beer vending machine, only to find that a can of Asahi was selling for 700 yen. After checking things out, Kyoko led us upstairs to the VIP area. We got to sit at our own tiny table behind a velvet rope, with Tokyo’s important people on all sides. At the other end of the VIP area champagne was being served in real glasses. At this point almost everyone decided to go to the bathroom in groups or go to the bar, leaving me to guard the table. I don’t go to dance clubs very often, but I somehow always end up making a futile attempt to hold on to the table in a busy area by myself. I should have tried to interact with the people around me more, but I was feeling very out of place. Apparently I was sitting next to the king of the Tokyo gay scene for most of my time in the VIP. Eventually we all met up and made our way back to the dance floor. After several hours of dancing, crowds, sweating, and very expensive drinks, we all left in order to catch the last train home. We stopped outside Roppongi station to get donairs from a food truck before getting on the train. Unfortunately this made us miss our connection, and we ended up having to finish our trip home with a taxi ride. Although the music wasn’t my thing, I had a fun, although expensive, night out. Also, any night that ends with food truck donairs is a good one. Quote of the night “Amigo, please pick a language!” – Donair stand guy to the 3 Indian guys who ordered alternately in Japanese, Hindi and English. Today was a great day at work. First, I taught a group of really good kids, which is a rare surprise for me. I taught two lessons with high level students, had voice class (which didn’t work very well), and then got to spend one lesson observing one of the new teachers. As part of NOVA’s on the job training, lessons taught by new teachers are observed by experienced teachers. This is good for the new teacher because they get feedback and advice. This is also good for the experienced teacher because they don’t have to prepare a lesson. Out of the current training class of new teachers, nobody owned a watch. A watch or other timepiece is fairly critical when you are trying to get through a lesson plan in exactly 40 minutes. Knowing the time is also pretty important for living in a society where punctuality is valued. I mean, seriously, who doesn’t own a watch? (2014 update) The original post was written at a time before the proliferation of smartphones. I am sure that many people do not own watches these days. However, I would still recommend them for teaching English. Occasionally glancing at a watch looks far more professional than checking the time on your phone in front of students. Another night of 30 Seconds to Fame in the Hello House common room. Good times! Today was the first day for a new teacher who I will call Maria. Unlike most teachers who are in their early to mid 20’s, Maria was somewhere between mid 30’s to 40’s, but was one of those people who always appears youthful and vibrant. Like most new teachers, she was feeling stressed and overwhelmed on her first day of work, mainly due to NOVA’s minimal teacher training. One of my supervisors asked me to help, since I was only a few months removed from being a stressed out new teacher myself. I worked with Maria to help her get her files ready and plan lessons. This made my day quite a bit busier, but I was happy to help. After work we went out for a drink at a nearby izakaya. As we talked I learned that Maria considered teaching in Japan to be the next in a series of life adventures. She was one of those rare free souls who spends time travelling from place to place and really living life. After another drink or two, she admitted that at one point in her life she was the travelling mistress for a famous Grammy award winning musician (who will remain nameless here). Usually if someone makes a claim like that after a few drinks you take it with a grain of salt and smile politely. With Maria – I completely took her at her word. After I went home, I was still pumped up from a busy day at work and the alcohol, so I tried to relax by borrowing a a bootleg DVD copy of Kill Bill from one of the other Hello House residents. The picture quality was crap, the subtitles were hilariously wrong, and the disc was damaged so the last 20 minutes were completely unwatchable. Come on bootleggers – take pride in your work! (2014 Update) My original post lacked a lot of detail about Maria. I usually tried to avoid writing about my coworkers experience in the office while I was still working with them.